Chronic Pain Partners also offer this printable for teachers, and it is full of ideas for you, as a parent, as well. You will need your doctor(s) to submit a letter listing your child’s diagnoses, challenges and suggested adaptations. Tip 1: We actually submitted a list of items we felt were needed to our doctor and he followed up with those. It may be hard for your doctor to think of everything, so you might want to give them a nudge in the right directions, since you know your child best. Tip 2: Make sure you make a copy of EVERYTHING for your own records. That includes dietary, behavioral, learning, and physical needs and adaptations. As you review this blog and the above websites, make a note of the things you may want to ask your doctor. 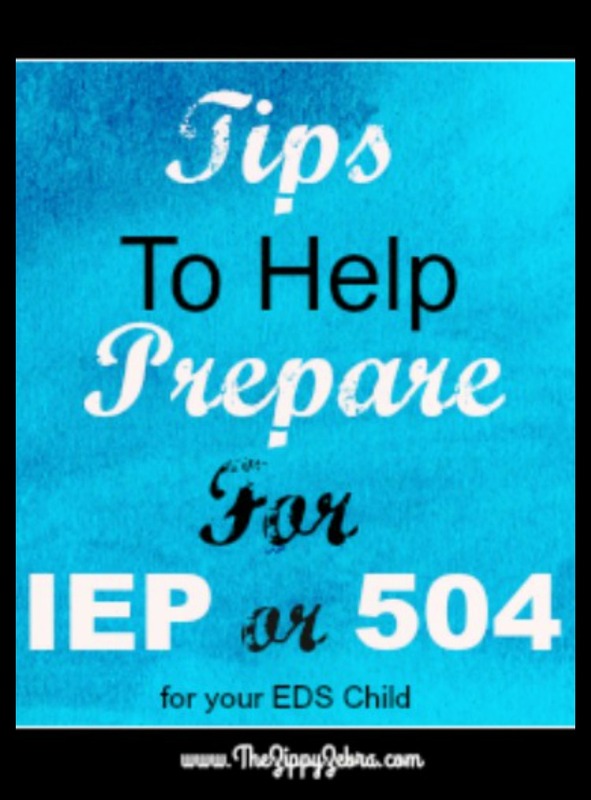 This EDS booklet is helpful and printable. 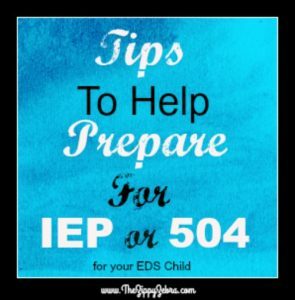 To begin our journey I simply copied the EDS booklet along with the diagnosis note from the doctor…highlighted the items I felt she needed and submitted it to each of her teachers until we were able to get a 504 in place. It can take awhile to set up all the players for the initial meeting. I still offer the booklet to any teacher who wants to learn more. Our doctor simply wrote my daughter’s EDS diagnosis, asked the school to make accommodations as we deemed fit, and removed her from PE and then Keyboarding class. Some schools will require much more detail and doctor’s information. Don’t worry, if you miss something it can be added anytime. 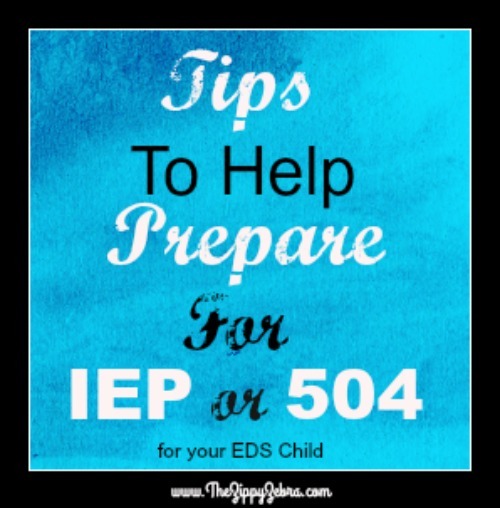 Plus both 504’s and IEP’s must be updated yearly. 3.) Compile a list of adaptations you feel your child will need and your reasons. This will also help you feel confident and build faith that you are ready to advocate for your child. 4.) Ask your child: What they feel would be helpful? What they struggle with? What causes the most pain? Example: My daughter needs to use a cushion to help with tailbone pain, but carrying it around embarrasses her. We have it in her 504, BUT she doesn’t use it. Talk to your child about this. They do not always tell us things in everyday conversation that they might need help with or be bothered by. 5.) Call the school and Schedule a Meeting. 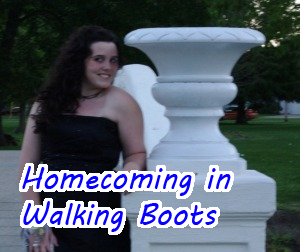 It can take awhile to assemble all the school participants, so you may want to call as you are getting prepared. 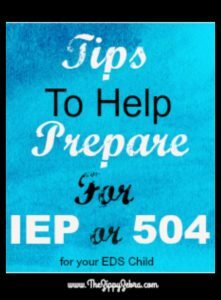 Your meetings may consist of yourself, your child’s principal, the person authorized AND trained to create the 504/IEP, in our case this is the school nurse. Some schools will attempt to schedule it to include your child’s teacher, counselor or other pertinent individual such as a one on one aide. Don’t be overwhelmed. They are not trying to strong arm you. The more adults that understand your child’s needs and can watch out for your child, the better. If you do have a problem address it immediately in a calm, respectful manner, occasionally one of the eggs at the meeting is rotten and needs to be replaced or corrected, just remember it is VERY likely your child’s challenges are new to them too. If you feel overwhelmed take someone you trust with you. The 504/IEP will not be typed up that day. Notes will be taken, ideas exchanged and meeting adjourned; then typed up, submitted for your approval, as well as the schools; then signed and added to the file. Do not leave anything out. If you think it might be useful later in the school year, ADD it. As I said, my school has been very accommodating even without everything being typed into the 504, BUT if you have it in the 504 it can help in later years with getting assistance in college and qualifying for disability. Student is allowed to make the decision whether or not to call home when he/she is sick or injured. 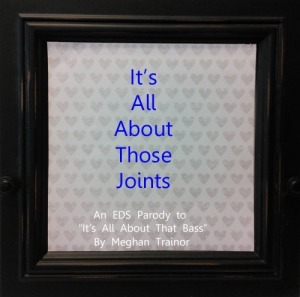 This was installed for my sanity as well as my daughters’….anyone with EDS knows we dislocate on a regular basis. Yes, it’s creepy. Yes, it hurts. No, it doesn’t mean our life ends. My daughter will reset her fingers, wrist, elbow and continue on her day. If the school called every time she dislocated a joint I would get nothing done. On the other hand, only she can tell when she is getting truly weak and needs to rest. So they don’t get to argue, she calls home and I come check her over. It helps that we live one block away. Student is allowed to choose to go outside or stay in. 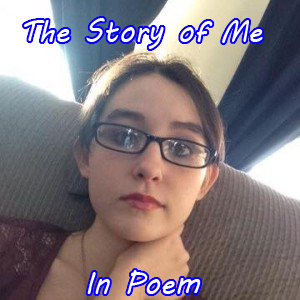 Due to POTS and other dysautonomic issues, heat causes my daughter to become devastatingly weak extremely fast, while cold causes severe pain. The teacher may be comfortable, but the current temperatures may cause my daughter may suffer a major setback. If she chooses to go out and gets sick, then she has to deal with it. IF they force her to go out and she gets sick, they have to deal with me. Only YOU truly know your child. Please keep that in mind as you are planning his/her accommodations. If you have any questions or testimonials please feel free to post them in our comment section and receive feedback from other readers. To discover more EDS sites, links and info follow us on Pinterest, Facebook and sign up for weekly emails. Check out the other posts in our series. This is good information to know! Thank you for sharing.